Sevylla del Mazo holds a B.A. in Cultural Anthropology, and is a full-time musician, teaching artist, mother, and founder of the Roots & Rhythms Cultural Arts Program. She has been on stage with Perry Farrell of Jane’s Addiction at SXSW 2009; plays in the Austin area with Latin-Jazz trio, Acoustic Jungle, opening for greats such as Aaron Neville at the San Antonio Jazz Fest; and Strunz and Farrah, Jose Feliciano, Earl Klugh, and The Rippingtons at One World Theatre. She is a member of Austin Samba's bateria section, and has recently begun accompanying Austin band Hardproof Afrobeat on percussion. Finally, Sevylla performs and facilitates for the Drum Cafe, an international, drum-based, team building organization. She was a founding company member of Lannaya Drum and Dance Ensemble in 2000, joining the board of directors in 2009, taking over booking and grant compliance until retiring from the company in February 2013. She was nominated as a 2015 KLRU American Graduate Champion for the impact of Roots & Rhythms in the Dove Springs community in Austin. Find out more about Sevylla by visiting her website at www.sevylladelmazo.com. Brock has been playing and studying various kinds of music for most of his life. In recent years he has focused mainly on West African drums, Australian Didgeridoo, and Indian Tabla. For the past two years he has been the Resident Teaching Artist at Cook and Pickle Elementary Schools, as well as the go-to person for school assemblies and workshops. You can find out more about Brock's projects at www.bolosegi.com. Elvie is a member of Lannaya Drum and Dance Ensemble's performance company and board of directors. 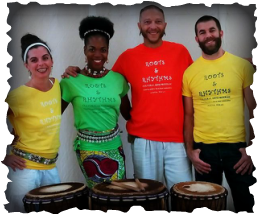 Roots & Rhythms is lucky to be joined on stage with her as she shares her love and passion for dance at our interactive school assemblies. Find out more about Elvie by going to Lannaya's website and visiting the company member's page. Noah has been drumming for 20 years. His performance career includes 6 years of touring with the international percussion sensation STOMP, and tours with Lost at Last (RCA records), Del Castillo, Atash, and scores of other award-winning bands playing Cuban salsa, afro-beat, funk, Brazilian axé, and many other styles. He has taught thousands of students here and abroad, working with the San Francisco Ballet's dance outreach program and the '99 Edinburgh Int'l Festival. Noah's teachers include the top names in many disciplines: Mamady Keita, "Changuito" Quintana, Mike Spiro, C.K. Ladzekpo, Fara Tolno, Jorge Alabe, Mabiba Baegne, and many ﻿more. Noah has been known to join Roots & Rhythms on stage for our school-wide assemblies. You can find out more about Noah by visiting www.noahmosgofian.com. Jesse is completing a dual BA in Spanish and Portuguese and a Bridging Disciplines Program in Social Entrepreneurship and Nonprofits at the University of Texas. As a credit intern, he is assisting in teaching at the Roots & Rhythms Spring 2015 Houston Elementary program. Jesse performs with Austin Samba, Trem do Samba, and Maracatu Texas, and has studied vocals, guitar and percussion in the U.S., Brazil, Guinea and Cuba. He has been awarded a Gold Level President's Volunteer Service Award by U.S. President Barack Obama, and an Unrestricted Endowed Presidential Scholarship by UT President Bill Powers for his service learning achievements, and recommended by the Institute of International Education for a 2015-16 U.S. Student Fulbright Grant to research community performance and social movements in Pernmabuco, Brazil. Follow or connect with Jesse on LinkedIn or Facebook.